I want to use this blog post to give a shout out to my friends back in the United Kingdom, you have a very special lecture coming your way. My old friend and colleague Paul Romhany is going to be giving a limited lecture tour in England and lovers of strong commercial magic should definitely not miss it. Paul will be familiar to many of you as the editor of the groundbreaking Internet magic gem ‘Vanish Magazine’ which has become an Internet sensation since he founded it a little over two years ago. Averaging over 100,000 downloads of each issue it has quickly revolutionized the magic publishing industry with its high quality articles and visually exciting presentation. I am proud to have been a contributor to Vanish from its very first issue. A professional entertainer of some note, Romhany has been performing for over twenty five years as a full time magical entertainer and won many accolades and awards along the way. Paul has appeared in over 100 countries with his Gold Medal Award winning Charlie Chaplin act and in 2012 won the coveted ‘Top Variety Artist in New Zealand’ award. He was also a recipient of the ‘Robert Houdin Award.’ He is recognized as one of the busiest and hardest working magicians in the business. Others of you out there will be familiar with Romhany from the steady stream of highly commercial and audience tested routines that he has released over the years. His original routines, books and videos are a wonderful contribution to the magic world. Some items such as Paul’s ‘Dream Prediction,’ ‘Linking Hearts’ and ‘Extreme Snowstorm truly deserve to be listed as contemporary masterpieces. All of his routines are created and perfected in the forge of performance and not just pipedreams; his creations are practical and STRONG. All these years of performing have given Romhany a unique perspective of performing in a large variety of specialized areas including, cruise ships, variety shows, corporate events, television and trade shows. Those of you who know Paul understand that it is just not in his nature to walk away from an experience without learning something. It is lucky for us in the magic world that he has chosen to share his insights with us. I saw Paul lecture last year in Vancouver at the ‘3 of Clubs Convention’ and was very impressed with his ability to combine teaching great magic while simultaneously dispensing tips and techniques that he has acquired during his career. You get a wonderful insight into a brilliant and perceptive mind. If you don’t walk away from his lecture a better magician than when you walked in—you just weren’t paying attention! Topics that are included during Romhany’s lecture cover the magical gamut from close-up, to Mentalism, with plenty of good visual comedy magic included into the mix. 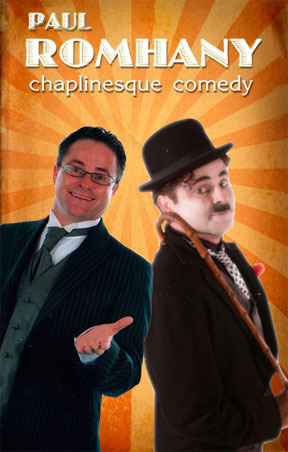 Coupled with his magical stories and excerpts from his award winning ‘Charlie Chaplin’ act attendees are in for a treat as they enjoy this one of a kind learning experience. Here is a list of Paul’s English lecture dates. I wish I were able to be there particularly on the 22nd when Paul will be lecturing at my old magic club the Sussex Magic Circle! If you are able to attend one of these lectures then DO SO! You won’t be disappointed. ~ by Nick Lewin on May 9, 2014.